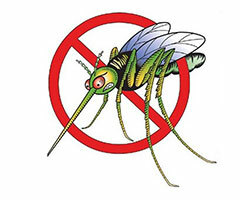 Our mosquito control is guaranteed to have you back in the yard 30 minutes after application. 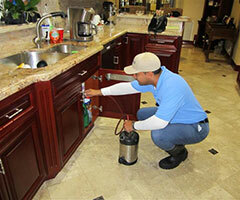 Our trained technicians apply a power mist on all areas which breed mosquito larvae and live biting mosquitoes. Treatment is on the perimeter of the home, lawn and ornamental plants which can hold standing water. All treatment insecticide are synthetic pyrethrum’s made from a compound found in crushed chrysanthemum flowers. Cleanout (First time, “Attic to Ground Service”). We recommend this service to start, as it is a thorough inspection and treatment of the property from the attic to the ground. Our trained service technician will dust the attic, and the wall voids. They will go between the dishwasher, stove, oven, and refrigerator with a crack and crevice treat. Treatment under the kitchen/bathroom sinks into the pipes, flushing behind the walls. The service continues on the exterior, drenching the foundations. We will treat porches, patios and window sills, completing a “PERIMETER BARRIER TREAT”. We finish by also power treating the lawn. This service should be completed once a year to maintain the interior protection for your home. Following this treatment we will treat the perimeter monthly to guarantee the inside for one year. This is our most complete service as it covers all your lawn needs. Included is an initial granular fertilization application done twice a year, selective weed control treatment, and treatment for all lawn pest and fungus. This treatment is on a bi-monthly service plan. Perimeter Barrier treatment is a chemical barrier placed monthly around the exterior of your house to prevent a re-infestation of insects into your home. An inspection of the perimeter is done at this time. 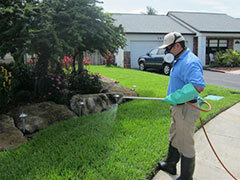 We offer several different services for lawns including treatments for ants, fleas, tics, grub, and chinch bugs. You can choose to have these treatments on either a bi-monthly or quarterly schedule. We will be happy to help you choose the correct service to meet your lawn needs. The technician will remove all visible eggs sacks and spiders from the screens then chemically treat the entire enclosure. A quarterly service that includes treating all bushes and shrubs. We treat for insects such as whitefly, thrips and mealy bugs. Ornamentals and shrubs are also treated for fungus and sooty mold that can inhibit growth and cause the plant to fail. Included with this treatment is a liquid nutrient that will fertilize boosting growth and overall plant health. This ornamental treatment is specially tailored for the ficus hedges and trees in combating the “Fig White Fly” infestation. Aggressive treatment begins with an injection of the appropriate amount of chemical into the root system called “root treat”. Where we can we also foliage drench treat. This is followed by continued monitoring and additional treatments as needed, to insure plant health and longevity. Ficus is also fertilized by root drench with a high grade nutrient to help it recover and stay healthy. A systemic treatment for palm trees, Gumbo Limbo trees and other newly affected trees. To treat white fly we must use a root injection system, “root drench” or “drilling and injection” into the trees. This is followed by continued monitoring and additional treatments as needed, to insure plant health and longevity. A twice a year service, with 7-9lbs of magnesium and boron per palm. Professional Pest Tech offers a safe and effective solution to rodent infestations using a trapping program. & for a FREE estimate.